Hanoi (VNA) – Vietnam’s U23 team beat Thailand 4-0 in the last match of Group K within the Asian Football Confederation (AFC) U23 Championship qualifiers at Hanoi’s My Dinh Stadium on March 26, securing a berth in the final rounds in Thailand next year. Ha Duc Chinh (number 18) scored the first goal for Vietnam in the 17th minute. From a through ball in the midfield, Chinh shot through the legs of Thailand’s goalkeeper to open the scoreboard. In the 21st minute, Vietnam’s Doan Van Hau (number 5) received a yellow card for fouling on a Thai player. Thailand pushed up their game, but made almost no serious threats against Vietnam. In an effort to follow the ball, Trieu Viet Hung (number 7) of Vietnam committed a foul and got a yellow card. The first half ended with two additional minutes and no more goals scored. Just a few minutes into the second half, Vietnam’s captain Nguyen Quang Hai (number 19) dribbled past four Thailand players and crossed inside the box for Nguyen Hoang Duc (number 14). Duc volleyed the ball in, netting the second score for Vietnam in the 53rd minute. In the 63rd minute, centre-back Nguyen Thanh Chung (number 16), from a free-kick, taped it in for Vietnam, securing the third goal of the match. 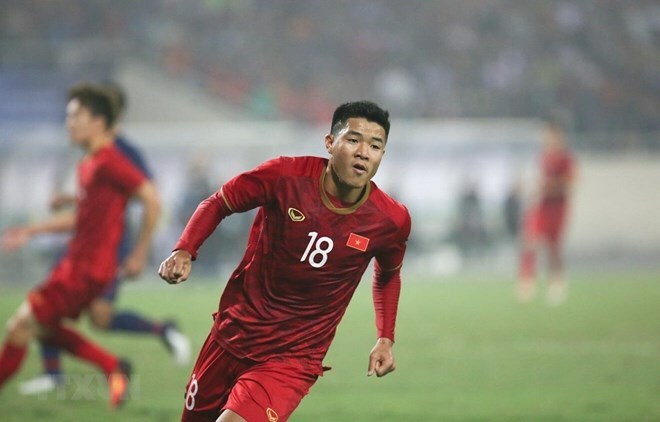 In the 92nd minute just before the end of the match, Vietnam netted the fourth time, with substitute Tran Thanh Son (number 8) making it 4-0 via an unstoppable shot. With the victory, Vietnam now officially qualifies for the final round of the 2020 AFC U23 Championship with the first place of group K. Meanwhile, Thailand has a default place as the host of the 2020 AFC U23 Championship. Vietnam were in Group K in the qualifiers, along with Thailand, Indonesia and Brunei. Matches for the group took place at the My Dinh National Stadium in Hanoi from March 22 to 26. Earlier, Vietnam thrashed Brunei 6-0 on March 22 and defeated Indonesia 1-0 two days later. Meanwhile, Thailand beat Indonesia 4-0 and defeated Brunei 8-0 in the pervious matches.